Russian scientists confirm that life in space is not only possible but also potentially dangerous. After reviewing the initial results of the Biorisk experiment conducted at the International Space Station (ISS), the Institute of Medical and Biological Problems at the Russian Academy of Sciences warned of a potential threat that micro-organisms from space may pose to Earth. According to researchers, there is a need for stiffer planetary quarantine, as the tested objects not only showed astonishing survival capabilities but also mutated in a number of unforeseen ways. Essentially, the experiment sought to investigate the behavior of different life forms in outer space. To achieve this task, several containers packed with plant seeds, dried insects, primitive crustaceans in anabiosis, fungi and bacteria were attached to the side of the ISS and examined for changes at various time intervals. The first container was decoupled from the station 13 months after the experiment began; the second was removed after 18 months; and the third after 31 months. 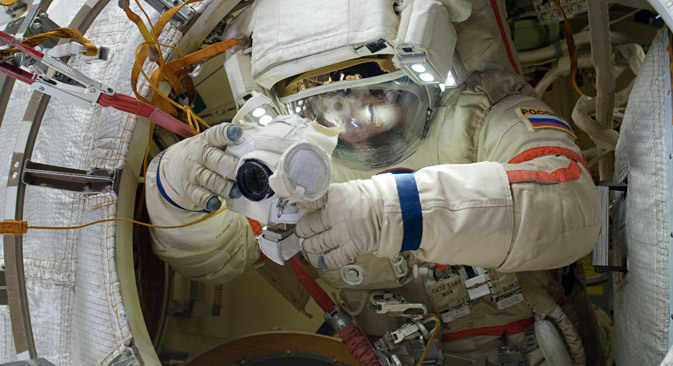 ISS cosmonauts Gennady Padalka and Yuri Malenchenko had to make a several spacewalks specifically for this mission. It turned out the risk was worth it. “The issues of planetary quarantine are now more pressing than ever. The experiment demonstrated the ability of micro-organisms to survive in outer space for extended periods of time. Moreover, the intrinsic properties of the micro-organisms changed rather drastically over the course of the study. Such transformations owed to the adaptive potential that helped the micro-organisms survive in adverse conditions,” said biologist Natalya Novikova, who serves as the space experiment supervisor and head of the Habitat Microbiology Laboratory at the Institute of Medical and Biological Problems. Recently, she opened the containers and examined the biomaterial delivered from orbit. The study results indicate that the seeds of higher plants, mosquito larvae and eggs of primitive crustaceans survived more or less successfully in outer space for 31 months, while the bacteria returned from space with altered physical properties. One example is a strand of the bacteria B. subtilis, which demonstrated an unusual division pattern with numerous septa instead of one. The fungi A. versicolor and P. expansum underwent significant changes in their cell structures. Other bacteria were found to be abnormally resistant to a wide range of germicides. The nature and unpredictability of these changes caused concern among biologists. “There is no doubt that certain terrestrial micro-organisms are capable of going to space and returning to Earth safely. What is unclear, however, is what kind of transformation such micro-organisms may undergo on their way back. And we simply have no idea whether or not they are dangerous to people,” said Novikova, who supports the idea of treating such space-travelling bacteria as carriers of highly infectious diseases. Experts highlight that the experiment has both practical significance for the establishment of new spaceship sterilization requirements and fundamental scientific value for new evidence of the extraterrestrial origin of life on our planet. The capability of bacteria to adapt to the extreme space environment is a testament to the fact that they have been practicing this “skill” for a long time. Firts published in Russian in the Izvestia newspaper.